American River College’s football team (5-2 overall, 2-0 in conference) will be playing a familiar opponent in Sierra College (3-4 overall, 1-1 in conference) on Oct. 31. Sierra, ranked No. 3 in the national NorCal conference, has faced off against ARC in each of the last eight seasons, with ARC winning four of those matchups. These games included a 31-22 ARC win at Sierra in 2014, and ARC has won two of the last the last three games. ARC head coach Jon Osterhout said he “absolutely” would consider Sierra to be a rival of ARC and that there is an added sense of urgency in this game. It is because of this familiarity, Osterhout said, that makes preparation for the game during the week easier for both teams. Each of Sierra’s losses, with the exception of a 45-28 loss to Laney College, have all been within five points. This season, Sierra has been led by its passing game. Sierra currently ranks No. 1 in the state in both total passing yards with 2,669 and passing yards per game with 381.3, while ranking No. 2 in the state with 28 passing touchdowns. Sierra has amassed this total even though it has started two different quarterbacks throughout the season, freshman Cole Brownholtz and sophomore Kyle Cota. Brownholtz, who was heavily recruited to ARC coming out of Jesuit High School, is coming off a 2 touchdown, 210 yard performance against Butte. ARC defensive coordinator Lou Baiz said that his defense’s matchup with Sierra will be a challenge. “They got great skill guys, they’re very good up front, two great quarterbacks, so they got great personnel, great schemes, and they’ve executed very well all year,” said Baiz. Its passing offense is bolstered by sophomore wide receiver Devin Gray, who has 48 receptions for 860 yards and 9 touchdowns through just seven games. Gray heads into the matchup with ARC on a hot streak, having caught 11 passes for 161 yards and 3 touchdowns last week in a 30-27 loss to Butte College. Osterhout said that although his defense can scheme for Gray, his defense isn’t afraid to play man-to-man coverage on him as well. Sierra’s defense, which allows 399.4 yards and 28.7 points per game, is led by sophomore linebacker Ascension Vela, who averages 9 tackles per game, and freshman corner Johnathan Fletcher, who leads the team with 6 passes defended. 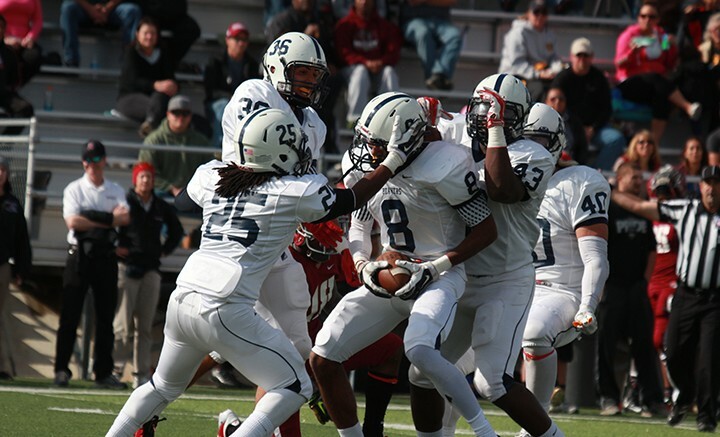 Be the first to comment on "ARC looks to go 3-0 in-conference vs Sierra College"